The Bold Look Of Asphalt Paving Makes A Lasting First Impression. 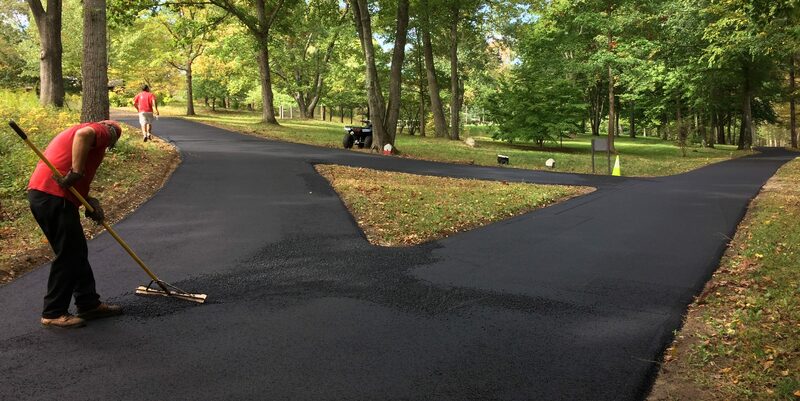 Asphalt paving, also referred to as “blacktop”, has long been a standard for driveways and parking lots in Westchester and Fairfield Counties. The smooth black finish of asphalt provides a striking contrast to the bright, natural colors of your home and landscaping. A freshly paved driveway presents a classy and well-kept look that will leave a lasting impression on anyone who arrives at your home. Ridge Paving Is Equipped To Handle Any Size Residential Or Commercial Project. Large commercial jobs require large machines and skilled paving experts to operate them. Paving driveways requires tremendous attention to detail and extra precautions so as not to disturb the existing landscape. From small parking pads and walkways to roads and parking lots, our team has the expertise and equipment to take on any sized asphalt paving project. From Grading & Excavating To Paving, Our Hands-On Owners Oversee Your Project. Whether you’re constructing something new or just looking to repair, Ridge Paving can handle the entire process. We’re not one of those contractors who is happy to collect your check and then let someone else do the work. From estimating through inspection of the finished product, our clients appreciate that our top people are on site making sure the job is getting done right. Trust A Family Business With Decades Of Asphalt Paving Experience. Ridge Paving was founded by Ernest Legge Sr. in 1956 and quickly earned a reputation for outstanding quality and unmatched customer service. Today, his son Ernest Legge Jr. and grandson Brian continue to operate the company with those same values and traditions at their core. When you hire Ridge Paving, you benefit from more than 60 years of paving experience in Westchester and Fairfield Counties. Ready To Get Your Next Asphalt Paving Project Started With A Free Estimate?